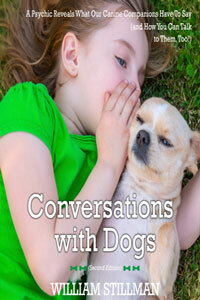 Have you ever wanted to know what your dog would say if he could talk? Now you can! Believe it or not, our canine companions have a lot to say beyond eat, drink, sniff, play and protect. In this fascinating new book, psychic William Stillman explores the dialogues he's had with dogs and reveals their inner most thoughts about their owners, their roles and the cycle of life. Also included is a step-by-step process for engaging your furry friends in a similar manner. Expect the unexpected as you prepare to enrich the relationship with your dog as a pet owner, friend and human parent.